One of the exuberance of youth to me is going out on dates. It gives you this surge in self confidence as you know someone had actually asked you out and would like to know you better. It’s a great feeling when someone takes an extra interest to you and there’s the whole dressing up part for the wooing and dining which is always fun. Sadly it had been a long time since I had dates and in an impulse attempt to revive it, I asked a friend out. A dear friend of mine, PY whom also had been a lil’ drained in the love department. There are so many reasons to ask her out, for one, she’s a great companion and then, there’s the part I know, there’s never a chance that she will bail on me. So we went out. A day before, I asked my local Penangnites friends on where can I go for good food, good ambience and all must come with a fair price due to the constraints of being a student. 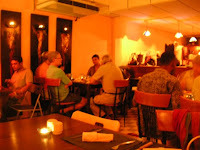 I was then referred to this small restaurant located right in the middle of Georgetown called Pintail. It is on the same row as Cititel Hotel, right opposite Oriental Hotel. Pintail, sandwiched between the old buildings is dimly lighted and with a signboard that isn’t too prominent for new diners to come to realize. My date with PY happens on a Wednesday evening where both of us took a little initiative to dress up for dinner and then, dancing later on. It wasn’t hard locating it but it was not prominent like I mentioned. Just a shop lot on its own, and a very warm ambience upon arrival, it was pretty packed on a Wednesday night. We were lucky to get the final table and as I realized it was mostly backpackers, tourists and some locals dining there. 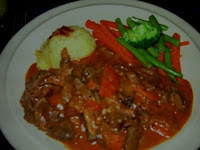 I ordered rosemary lamb with a serving of sautéed vegetables in butter and pepper and mashed potatoes. PY had a half done steak with diced potatoes and sautéed greens as well. I would give a lot of credits to their selection of drinks which were made up of fresh fruits juices, on its own or a mixture and even alcoholic beverages at a fair price. My honey lime got me hooked as it was made perfectly for the sweet tooth that I am. 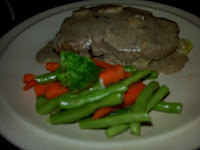 I wasn’t too pleased that my lamb was all chopped up for me upon arrival but I love the vegetables and mashed potatoes. PY’s steak was a little chewy and her potatoes were rather blunt. It fascinated me that she could eat it all with her braces. 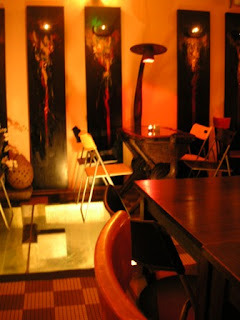 But overall, I love the ambience and the service is extremely friendly. Cozy, warm and serves good food at a fair deal, I will definitely go back to that place more often. The bill for our meal was a little over RM60. Last order of the day is at 10.45pm and the restaurant closes at 11.30pm. Opens whole week except on Mondays. From noon till night.